Dominique Simonnet is a writer, publisher and journalist. He is the author of numerous fiction and non-fiction books. He created and anchored several TV and radio programs on national networks. He contributed to popularize science, arts and culture for the general audience. He is the publisher of the serie La Plus Belle Histoire de… (Seuil) and several books including Letters to My Mother by Ingrid Betancourt (2008). 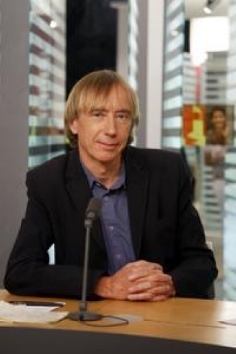 Until 2006, Dominique Simonnet was a senior editor at the French weekly newsmagazine L’Express. He was in charge of « The Long Interview » for which he met many of the greats of the moment. His best seller, La Plus Belle Histoire du Monde (with Hubert Reeves, Joël de Rosnay, Yves Coppens), sold over 300 000 copies in France and was translated in 25 countries. It appeared in United States as Origins (Arcade Publishing). With Nicole Bacharan, he wrote L’Amour expliqué à nos enfants (Love Explained to Our Children) and a serie of novels for young adults (Nemo). He was also a founding member and a theorician of the French environmental mouvement.